Last year at Photokina, Panasonic, Leica and Sigma announced an L-mount alliance, which aimed at making lenses between these companies compatible with their APS-C and full-frame offerings. 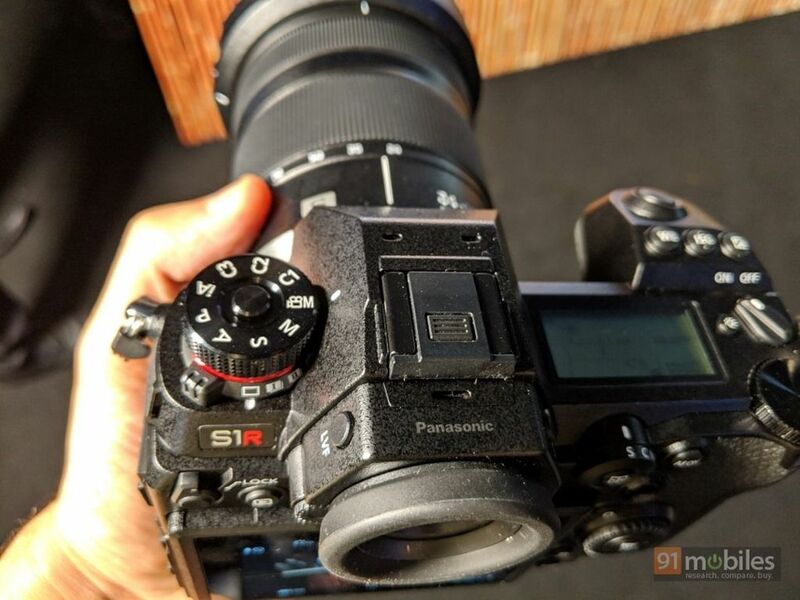 At the same event, Panasonic had teased the launch of its full-frame mirrorless shooters in the form of the S1 and S1R. The cameras went official earlier this year, and now they’ve made their way to India. With a starting price tag of 2 lakh, there’s no doubt that the Panasonic Lumix S1 and S1R are aimed at professionals. But can the duo challenge Sony’s dominance in mirror-less cameras as well as counter the increased focus in this category from the likes of Canon and Nikon? 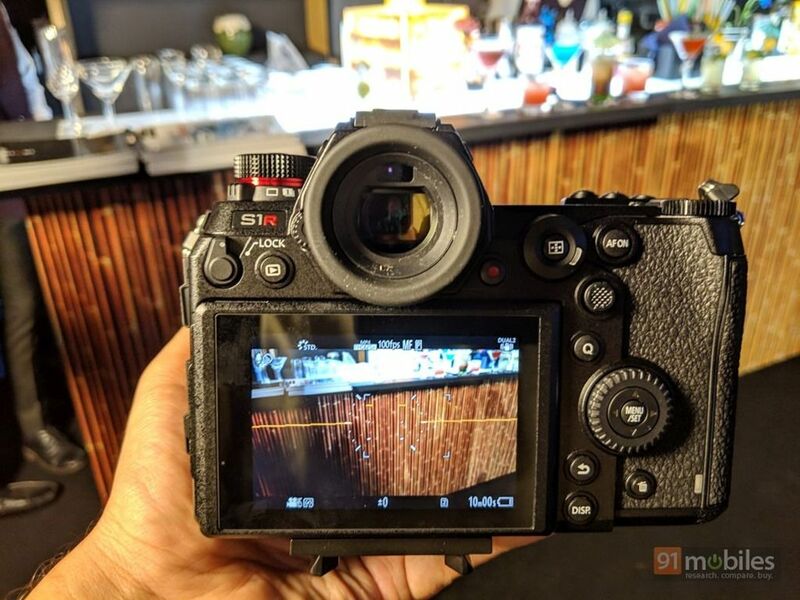 While only time (and our review) will answer those questions, I managed to spend some time with the new cameras from Panasonic and here’s how I’ll sum up my initial impressions. Tipping the scales at almost a kg each, both the Lumix S1 and S1R are quite heavy, which is odd considering mirrorless offerings are supposed to be relatively lighter when compared to DSLRs. The cameras also seem quite angular with sharp edges as compared to most shooters in this class. Having said that, the devices seem to be quite robust thanks to use of magnesium alloy. The duo is also dust- and splash-resistant. The details here are mainly based on the Panasonic Lumix S1R, since it shares most of its features with the S1. 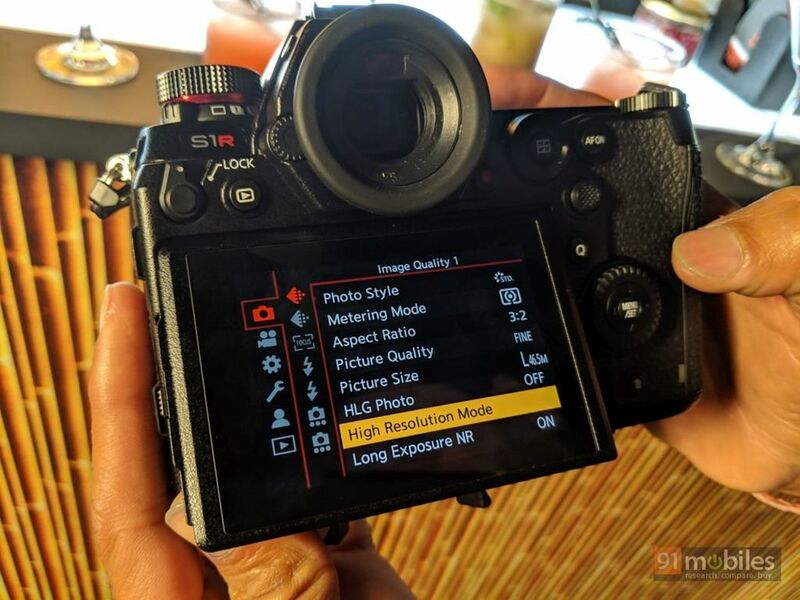 Up top, you’ll find a large LCD panel that displays image settings at a glance, alongside the on / off dial, with the shutter button, and controls for white balance, ISO and exposure further ahead. 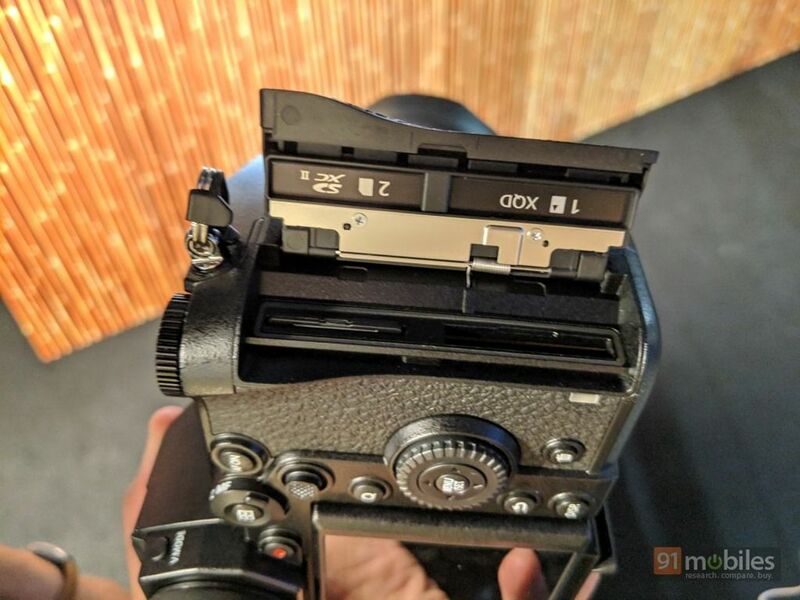 Interestingly, the mode dial is located towards the left of the hot-shoe mount, which is an unconventional placement. At the back, you’ll find 3.2-inch displays with 2.1-million dots on both the S1 and Panasonic Lumix S1R. The screen can be tilted letting you use the camera in various angles. 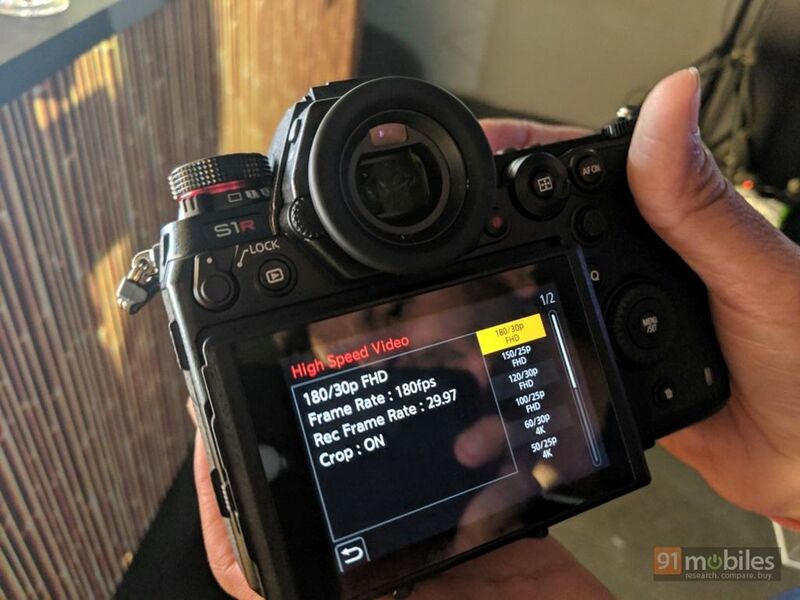 Along with that, there are the usual buttons such as Lock, preview, autofocus on, metering mode, Q menu, back, display and delete. Interestingly, the four-way D-pad also doubles up as a rotary dial with the Menu / set key present in the centre. The EVF offers a high resolution of 5.76-million dots ensuring what you see is what you get. The S1 and S1R can accept two cards, with one of them supporting the XQD standard. The slots are located on the right spine. Coming to their differences, the S1 has a 24-megapixel sensor, whereas the Lumix S1R boasts a 47.3MP sensor. 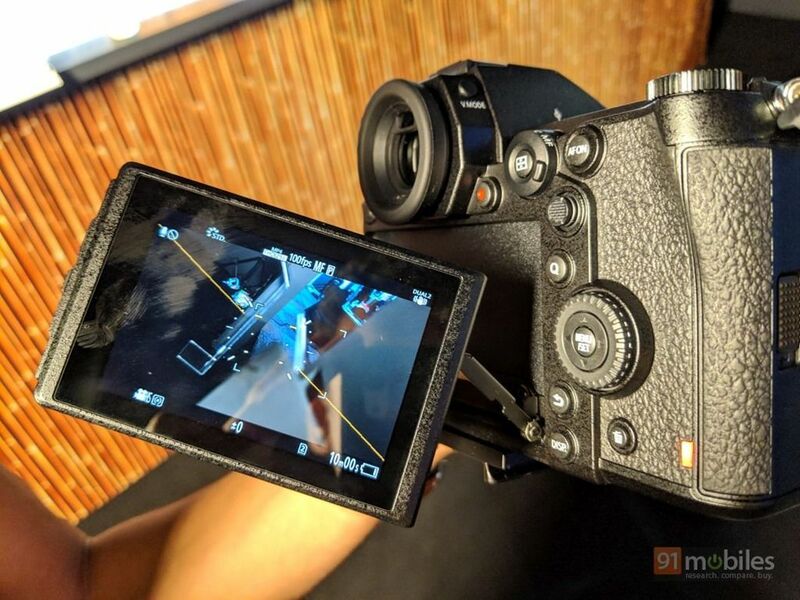 The affordable sibling is being aimed at videographers with features like 4k@60fps (maximum of 30 minutes), and 4k@30fps recording (just limited by available storage). The S1R on the other hand, caters to professional photographers with its higher resolution, and one can even opt for the High Resolution mode to get a 187MP RAW output (96MP image in the case of the S1). The S1 also has higher ISO sensitivity of 51200 as compared to 25600 ISO supported by the S1R. The shooters can also record slow-mo videos at 180fps at full HD resolution. The other similarities between the cameras include 5-axis in-body stabilisation which can offer 6 stops of shake reduction when coupled with an IS lens, or 5.5 stops in case of a non-IS lens. Sadly, there’s no phase detection autofocus on the S1 duo. Yet, the brand claims that the devices offer fast autofocus with Contrast AF and DFD (Depth from Defocus) technologies. In theburst mode, the devices can shoot at 9fps, while at continuous autofocus, they can capture at 6fps. If you think AI is being used in just smartphones, think again. Panasonic is utilising artificial intelligence capabilities to offer better focusing. Both the Lumix S1 and S1R make use of deep learning to quickly focus on people and animals. 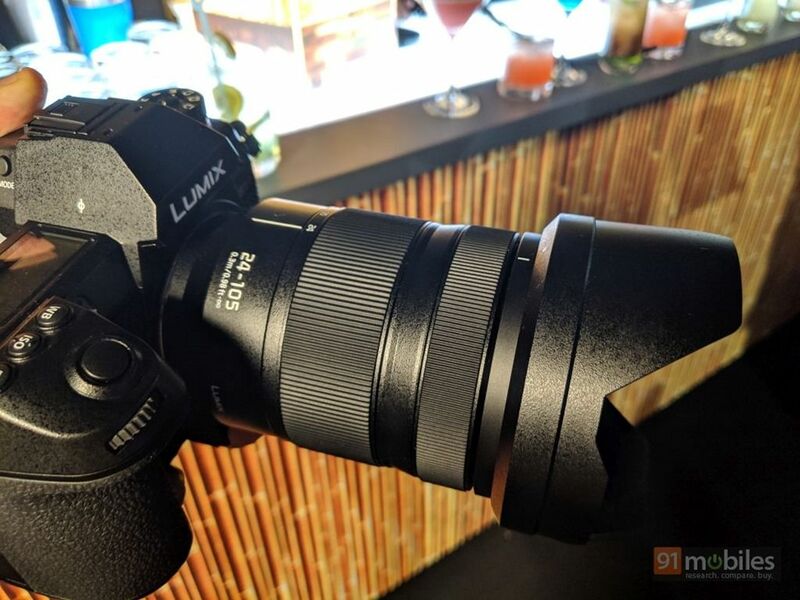 As far as lenses are concerned, along with the L-mount lenses, Panasonic has launched 50mm f/1.4, 24-105mm f/4 and 70-200mm f/4 options in India. For the kit lens, buyers can get the new Lumix S1 and S1R with the 24-105mm lens. 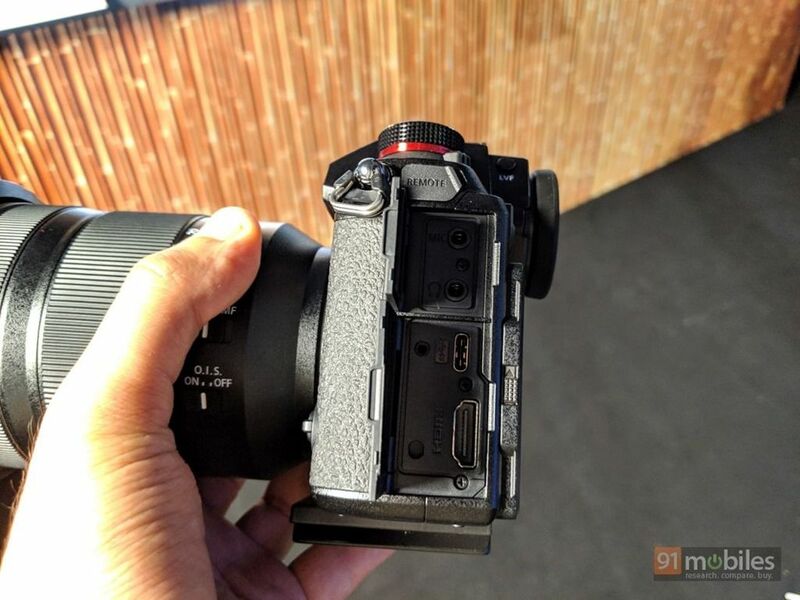 But that’s not all, thanks to the L-mount alliance, the mirrorless shooters can take advantage of as many as 42 lenses over the next two years, with Panasonic expected to launch 10 lenses. 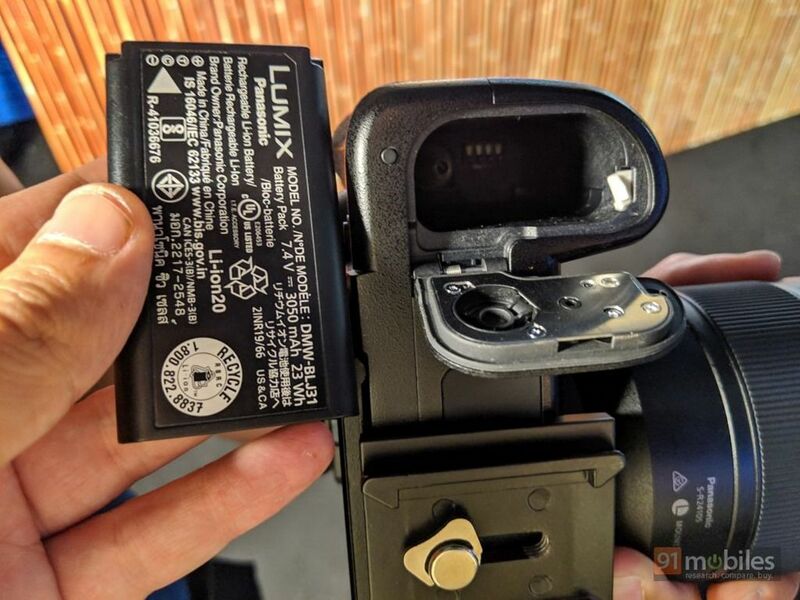 Juicing up the Panasonic Lumix S1 and S1R are 3,050mAh batteries, which promise up to 400 images on a single charge with the use of SD cards. Furthermore, the camera supports USB Type-C PD to be charged via smartphone adapters. The Panasonic Lumix S1 will set you back by Rs 1,99,990 for the body only, and you’ll need to shell Rs 2,67,990 to get it with the kit lens. 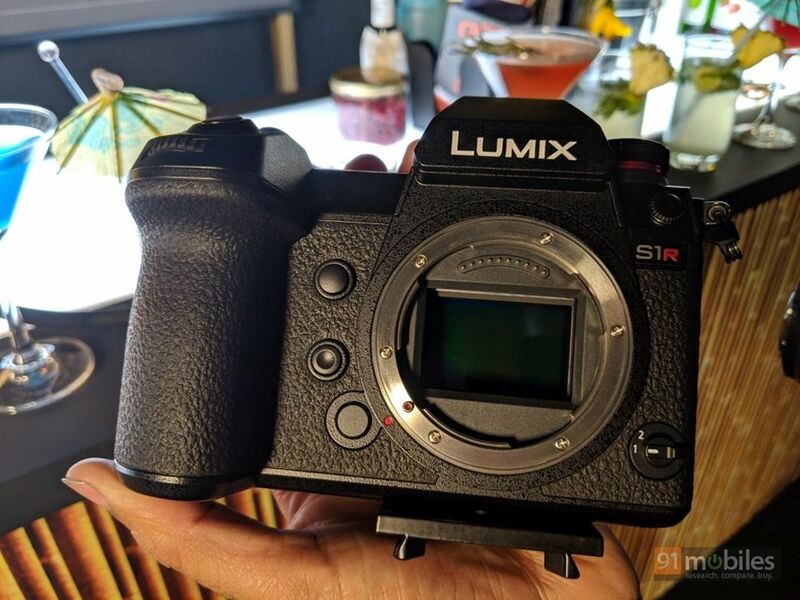 The higher-end Lumix S1R on the other hand, carries a price tag of Rs 2,99,990 for its body, and Rs 3,67,990 with the kit lens. For their asking prices, the Lumix S1 and S1R are up against serious competition. 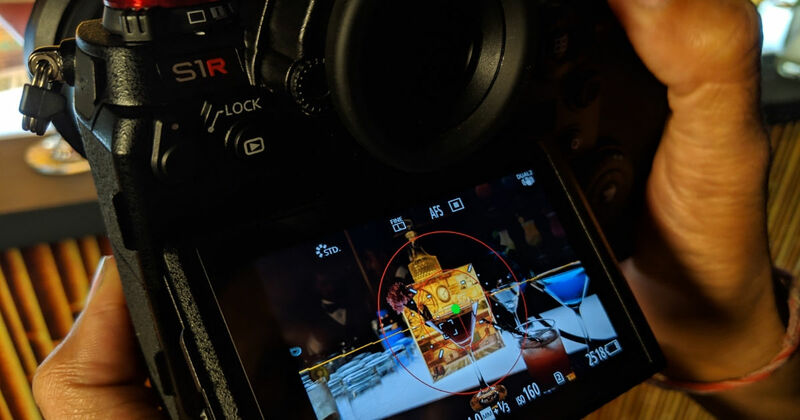 Sony’s Alpha A7R III is one of the best options in this segment, while the Nikon Z7 (first impressions) and Canon EOS R (first impressions) also offer a compelling set of features. Yet, thanks to some interesting functionality and the fact that they’re part of L-mount alliance does give Panasonic’s offerings an edge. We’ll certainly be putting the duo through their paces, so stay tuned.